The BEST Pasta Salad Recipe Ever! 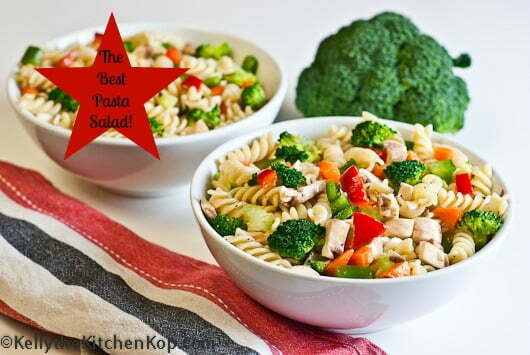 The Best Pasta Salad Recipe! Soon our garden will be bursting with fresh tomatoes and peppers, so along with the other veggies that I can snag at the farmer's market and the real foodie dressing ingredients, this makes the BEST pasta salad recipe because all the flavors blend so perfectly together. It's also a super easy salad to throw together for your summer cook-outs — it'll be a hit! The original recipe called for “Accent”. I had no idea what it was until I read the ingredient label on the bottle at the store, there's only ONE ingredient: MSG!!! Obviously, I dropped the bottle in the aisle and ran. It was still just as delicious without it. 1 chopped peppers, I like using all different colors. it makes it tasty and pretty! Mix together apple cider vinegar, olive oil, sesame oil, sugar, parsley, pepper and salt and chill while you boil the pasta and do the chopping of all your veggies. Once the pasta is done, drain and allow to cool a bit. Then in a large bowl, or the pot you just boiled the pasta in, add your pasta and the dressing you've had in the fridge, your chopped veggies and cheese and toss well to make sure all the pasta and veggies get coated with dressing. Serve cold. (This makes a delicious meal if you add some leftover cooked chicken to it). Do you know of good variations to this recipe? If so, please share in the comments! Have you heard all the news about plastic water bottles lately? Read about all the benefits of getting virgin coconut oil into your diet! Is Fluoride safe in your drinking water? Yes it is made with non- GMO corn. I found this info on their site just to be sure. Hope this helps! Thanks for the tip and link on the corn pasta – do you happen to know if it is made with non-GMO corn? I looked at the link and couldn’t find it – maybe it’s on the package? I actually found pasta made of corn. It’s healthy and tasta great. I can’t find it in the store so i buy online. It’s great if you have high cholesterol or diabetic. This is where i found it. Enjoy! I have tried the sprouted spaghetti with very good results (it has a bit of a different texture, but still VERY good imo), and it has a much nuttier flavor. It’s lighter than regular ww pasta, but has that nutty flavor. Wheras the brown rice pasta has the smoother texture (similar to semolina) but not as much of a nutty flavor. I’m anxous to try the penne. It’s on my list the next time I go to Harvest. Great ideas for healthier alternatives to pasta! I didn’t include olives, probably because I don’t like them! This looks very similar to my pasta salad recipe, although I have used brown rice pasta in the past, and this year I want to try the Ezekial sprouted penne that I’ve seen in the stores. The only ingredient that I add that I don’t see mentioned here are chopped greek olives from Horrock’s olive bar! We prefer a mix of several kinds, or simply kalamata olives. This really adds a wonderful flavor to the pasta salad. I have also diced up cheese or summer sausage (I get it from the Meerman’s) to make it a more hearty salad with a little protein.